Total loss: About 47 lbs! 2 Rounds of hCG in about 100 days time. Note since the time of this interview, Moe is now holding steady at about 133 lbs. She’s had some struggles in between and another successful round and been maintaining her weight successfully since June 2016 now. Season a cabbage steak like you would a rib eye. Smoke it or bake it, til tender. I use MCT oil and Tony Charcheres seasoning ….. You won’t be disappointed! Here’s the electric smoker Monique uses. There are others you can find through a google search here, or an example of one that looks somewhat similar on Amazon here. I have been a Multiple Sclerosis patient for more than 15 years. I am in menopause, a reformed cigarette smoker, and am about to be 52. I began Round 1 at 183.4 a size 16. I finished that Round at 150.2 (-33.2lbs). Forty days later I began Round 2, 6.6lbs LIGHTER, at 143.6, finishing Round 2 at 135.8, a size 6. That’s a total loss of, 47.6 lbs in 100 days time. I gained three pounds within 2 weeks and have maintained the size 6, for 6 months. After quitting smoking I gained 45 pounds over the course of 6 years. My husband (then boyfriend) taught me how to cook. It was such an intimate thing: To cook, and to eat. Everything went into my mouth. My triggers were meat & cheese trays, savory comfort foods and anything salty/crunchy. Good beer, good cheese, good wine, good chocolate. Everything, was good! I used 11 sublingual drops, twice a day. Being on P2, the Protocol itself was actually pretty simple. I loved the simplicity of P2: There are only so many choices. That’s what made it nice. I did take issue with not combining vegetables. Never understood it – especially as far as salads go. I found that I was successful with two (i.e., celery and romaine) if I kept to the total limit of 3.5oz. 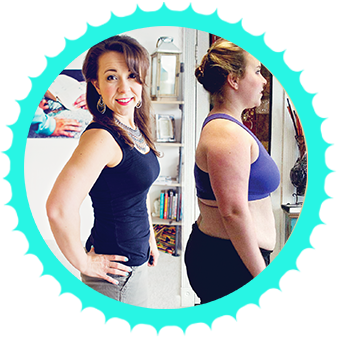 When times got challenging, I’d reach out to my food coach, and to Rayzel and her website. The Periscopes are so helpful, and give you the strength you need. It’s all about you, allow yourself that grace. Loading for me was like a license to be a fool, just one last time. I had hit rock bottom and this was my last hurrah. I made a pot of white chicken chili (I had won a chili cook off with that recipe) and ate the entire pot. I also went to KFC and ate like a crazy person. I ate tons of sushi and a bunch of mashed potatoes for good measure. I felt awful. Perfect for what followed. What did you find yourself liking to eat during Phase 2/vlcd – how would you prepare your meals? If you have a favorite recipe or meal you like for phase 2 feel free to include the recipe or link to the recipe. My husband and I smoke everything. We use our smoker 5 nights out of seven, most weeks. If I had to give a favorite recipe, I’d say there are TWO. One is the Dijon Herb Sauce. Run that through a blender until its super smooth. I love to use that as salad dressing, and it can be changed up so easily. I’d also put a thin line of it on romaine leaves, or line the romaine with some chili paste – with your protein choice for the meal…. Delicious. The other thing I just loved was smoked chicken slices out of the fridge (coz I’d cook/smoke all the weeks’ food on Sunday). I’d warm that in a small cast iron skillet with either Braggs or chicken stock and a ton of garlic on super low – just to warm it up (it was winter). At the very end of that first Round, I’d allow ONE nice onion string in there, and wrap that all up into a generous lettuce leaf. So satisfying…. The sanity “trick” to P2 in my mind is variety. That is not to say that I had a million recipes, because I didn’t. While there are a LOT out of recipes out there, I found there were a few things that I really liked that I could mix and match to my hearts’ desire: Smoked Chicken, Shrimp, Tilapia, Romaine, Celery, Spinach, Tomatoes. So delicious and so good for you. I mix and match those items indefinitely. I love them and to this day, I do not tire of any of them. They are what my 90% consists of, to this day. WHAT WORKS IS, TAKING YOUR TIME INTRODUCING NEW FOODS. I cannot stress this enough. There is absolutely no rush. It benefits you to basically stay on P2, while adding 250 calories a day over the course of several days; You’ll continue to lose (I weighed 6lbs less than my LDW when I began Round 2) while “resetting your metabolism”. I’d add 2 eggs w butter, on day one. The next day, add two bacon slices to that; On the third day (if all has gone well and the scale hasn’t brought out it’s big white flag), add half an avocado. On the fourth day, to that, add 2oz full fat plain yogurt. A menu similar to this should result in no gains, and will be easy to stay consistent, in P3. I still struggle with the notion that fat can be good. I have been brainwashed for so long that, I still feel guilty when I butter things. Butter, sour cream, cream cheese, full fat yogurt. Good for you. I had actually lost a little more than was healthy, and trying to maintain the 2lb window was nearly impossible. I let myself up 3 lbs and now maintain it almost without thinking. Doing this helps your sanity greatly. Rather than force the 2lb window, I can enjoy my new figure and my body allows it. Be cognizant of the clues your body gives you. What worked: Eating P2 foods, plus good fat. What does not: Trying to force a number that my body would not accept. “Everyday Life” consists of 90% clean, healthy eating. So much different than the meat and cheese trays with lots and lots of wine every day of the week. My life now consists of no less than one salad a day. I crave it. It’s crisp and it’s clean. My relationship with food has changed. I now know that, eating fresh and wholesome food makes me look and feel great! I enjoy coffee with half and half, and I enjoy a nice breakfast – with bacon if I want (just not ten pieces). Typical work day is full fat yogurt with seasonal berries. Salad at lunch with a reasonable portion of just about anything I want. Salmon, chicken thighs, even Miracle Noodles now …Pizza is still a no-no for me. But that’s OK, I just reserve it for a weekend or special occasion. Same with the wine and craft beers. I have to say that it’s moderation. You can have anything you want if you MAKE IT or cook it; if you serve yourself a rational portion size (Protocol teaches you THAT until you can do it blindfolded, right?) and you create it with fresh healthy foods you win! The idea is that MOST (90%) of the time you eat clean/right/healthy and then you can have a treat, occasionally. I’d make excuses for myself and my appearance when I went out. Now I stand up straight and have much more self confidence. I finally don’t mind it when I see my reflection. I can have anything I’d like, again – within reason. I don’t have a huge sweet tooth but I can have a cookie, maybe two. Or, I can have a burger. But not every day the way I used to. I just stop, when before I did not, could not. I’ll go for a walk to burn a few calories, or at least counter balance it mentally. If I have a small gain, I just have my yogurt and a salad and small portion of whatever for several days. I call it my Recovery Diet. Now, even the large gains can be managed. Staying on top of it and not letting it get out of hand is key. Staying on top of it and not letting your weight creep back up. That will sabotage your efforts in nothing flat. People who say, I lost it but it came back, didn’t learn a thing. Cheating and trying to do too much will also back fire your efforts during P2. I think Dr Simeons spoke about not doing strenuous exercise. A gal I counseled recently, was adamant about exercising. It was new stuff. Stuff that I’d never heard her speak of before beginning hCG. She just did not have the losses she could have had. I say to everyone, walking is encouraged. And that’s it while on P2. I say for guaranteed success, you have to follow the Protocol. Its human nature to challenge boundaries: The scale will put you in your place, every time if you try to challenge the rules. Another thing that I would tell everyone is that you should not be afraid of the VLCD. It’s not “so unhealthy”! It’s 40 days, and it’s much healthier than you are at the moment, let’s be honest. Short of being put into a coma and waking up 30-40 pounds lighter – trying hCG will change your life forever. Sorry we forgot to update the blog. Moe stopped coaching a while back. Hi it’s Moe. Apologies. I had no indication that people where trying to use the blog – it was not successful, so I deleted it. I am back – in the shape of my former self, and saw my old interview still here. Going to try the homeopathic pellets, and keep it off this time! Thanks for the all the great interviews, articles and support! How long were her rounds?? I did two 4,0 day Rounds. Thank you for sharing your story! Loved it! Inspirational! Did you ever have any slight dizziness within the first couple of days tarting the VLCD (after the loading days)? Suggestions on what can be done to avoid it? Yes, dizziness/nauseousness can be experienced during the first days. f it’s low blood sugar that could be a bit of a problem and you may need to adjust your dose a little or eat a little more. If you eat a little more and the feeling goes away, that might tell us something if it’s your dose that’s off. Rayzel’s dosing article is here: hcgchica.com/dosage. I personally felt no negative effects during either of my Rounds at all. this whole forum was so intetesting. i thank you for all the info….. i did one phase 2 and now resting on p4……. How do we dispose of our sharps? I have a sharps container but now what??? I found this website here so you can look up the rules for your particular state and figure out where to turn the sharps container in: http://www.bd.com/us/diabetes/page.aspx?cat=7002&id=10284. Please come see me at LoseMoeWeight.com!! Sorry, the website has been deleted. Thanks for interviewing a middle-aged woman! It’s hard to believe that ANYTHING will work for us because of our metabolism and hormonal changes that accompany middle age. I am feeling inspired and more determined to keep hanging in there. Delighted that I was able to help, in a small way. Good Luck! Enjoyed reading your story!! Who did you purchase your drops from? I would like to watch the video, however I cannot get the link to work. Thanks! Sorry but this one ended up being a written interview only.